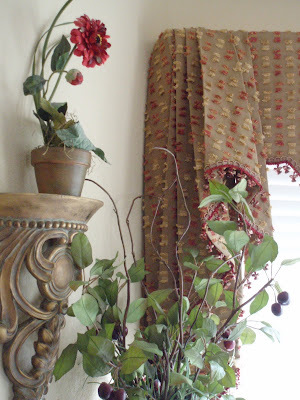 Blackberry House blog retail shop projects and painted furniture: It's a Window Treatment Party.....I'm all over that! It's a Window Treatment Party.....I'm all over that! Donna's having another party, and this time it's like she planned it just for me. 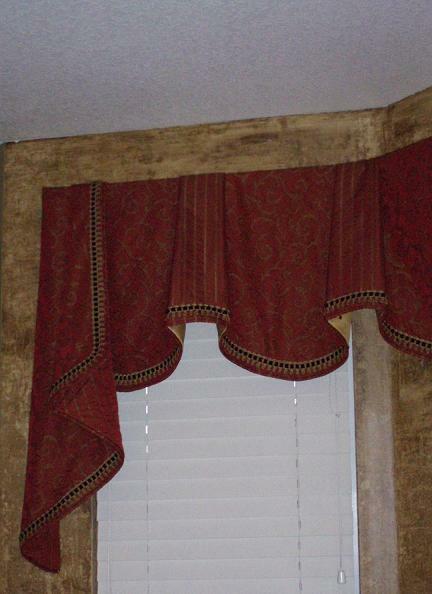 This weekend's party is featuring window treatments, which is right up my alley. I've been making custom window treatments for over 15 years now, and I don't think there's much about it that I'm not entirely passionate about. I could talk about and show you window treatments all day long, but then I'd forfeit a lot of future posts, so I'll save something for later. I thought about posting pics of clients windows, but I think I'll do that another day. Instead, I'll take you through my own house this time. You've seen this pic before, very recently, but I'll post it again so that it pertains solely to this party. This is in my living room. I love this toile fabric. One of my favorite things to do is sit in this front room and just look at everything around me. There's so much of my silver collection in here, and yummy fabrics that I just adore, that it makes it the best place to be in this house. 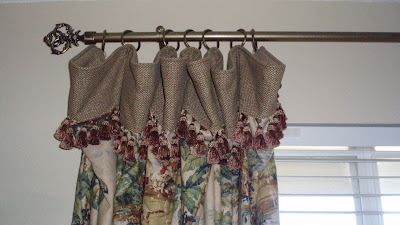 I used a contrast fabric on the top and added a cuffed application, along with a tassel fringe. These also puddle on the floor about 10", and I really like that. Next is the dining room, which is at the other end of this room. I wanted something that would cover the whole bay area, but opted not to have panels in this room. Ok, the truth is, the fabric I bought for the panels didn't match very well, so I decided not to use it. Unfortunately, this picture does not do this window treatment justice, but I don't have time to take extra pictures right now. This is a fun eyelash fabric. 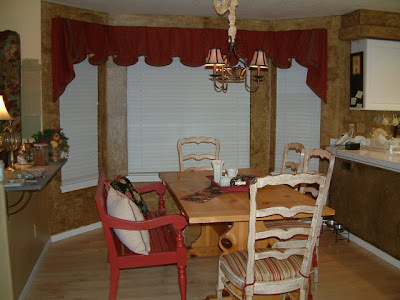 I see in these pics that the dining wall looks really light, but it isn't, it's a very warm gold. Bad pic, sorry. Moving on in to the eat-in area off the kitchen. 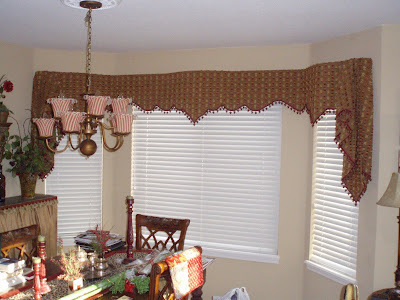 This is and always has been my favorite style of valance. It's dressy without being feminine, and tailored just enough to not be fussy. Simple fabrics are usually best for this style. I chose a tone on tone floral tomato red silk, along with a complimentary red silk stripe. I wanted a little bit more detail, so I added a rich black and gold velvet gimp to the edges. This treatment took me a total of 29 hours to make! This picture was taken very early on after moving in here. As you can see, the walls to the left had not been painted yet. When you're in the room, you can see the playful gold and black polka dot I put on the back for the lining. Well, when you were in this room. I say that because I had a client come by the house one day, and she was admiring this treatment and wondered if it would work in her office bay window. We went down to her house and measured and it was exactly the same! So I did what any reasonable minded person would do - I went home, took it down and carried it to her and installed it in her office. It looks gorgeous in there! Sad thing is, now my window is naked again. Here it is in a patterned fabric. (This is a client's kitchen.) It's still very pretty, but I just wanted you to see how you lose the detail when you use a busy fabric for this. Take one step down, and you're in the family room. This room has all of my favoritest colors in it. I chose simple tab tops in here because we close these all the time. However, I did embellish them with a few other prints. I've added buttons down the black bands in a leopard print, but haven't taken a new picture. I'll do that one day and come back to show you. Next is the guest room. Be forewarned, the pic shows the walls in here to be a bright aqua, but they are actually a soft teal. I'm sure you've figured out by now that I took a lot of these pictures before I knew how to properly navigate my camera settings. 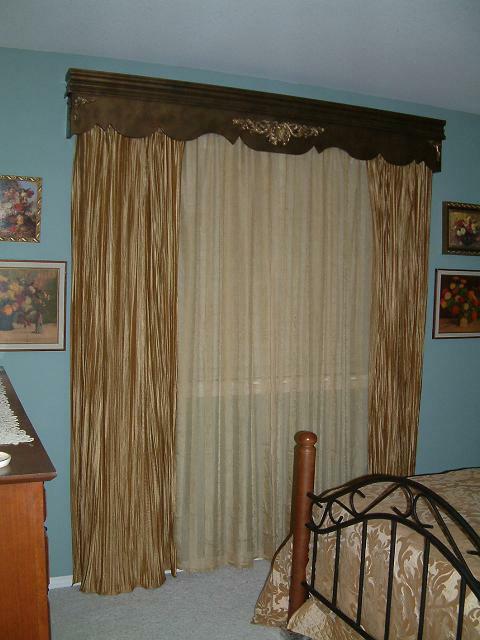 The panels and sheers in this room are the only store bought window treatments I have in the house. I had these left over from a staging job, so I decided to build a cornice for them! 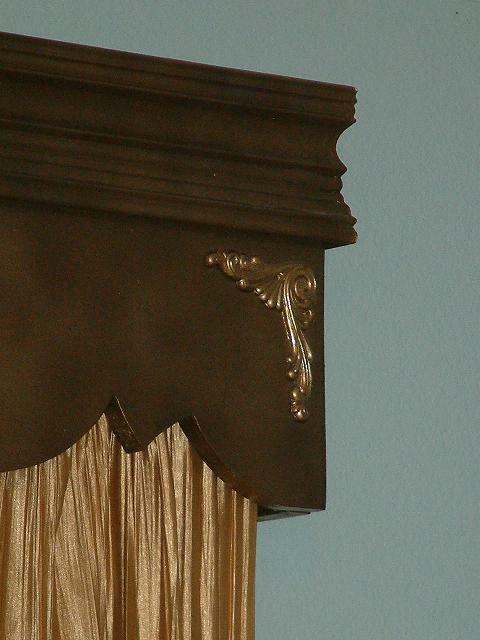 I built this cornice out of 3/4 plywood, and added a nice crown mold to the top. A friend and I painted it out in the driveway one night around midnight with a few different colors of spray paint trying to get ready for a party. A party at our previous house, actually. This was the dining room treatment in our last house. I love it when you can repurpose things. Down the hall is the master bedroom, and the last treatment I'll be showing you today. 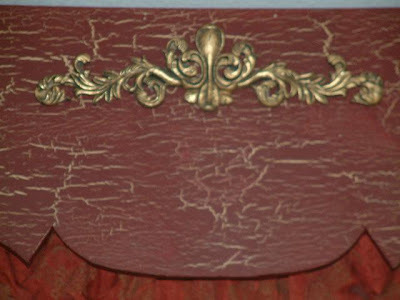 I made the same style of cornice (since it's easier to cut two at once), but I painted it very different. Ok, there they are. One thing I've learned from looking at these pictures is that I really need to go back and take better, more up to date pictures. 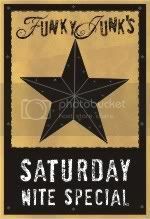 One of these days............I'll go ahead and add that to my list. Thanks for stopping by! 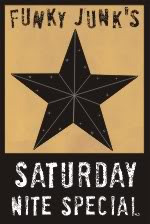 Now head on back to the party and see what everyone else has going on. Your work is amazing. AMAZING. You've pretty much written the book on what to do where. In your home, all those details and patterns fit so perfectly! You really know what to do with fabrics and details. And, you are so right, generally pics do not do justice which in your case, is bang on. When you zoom into the details, then I can really see the full bang. 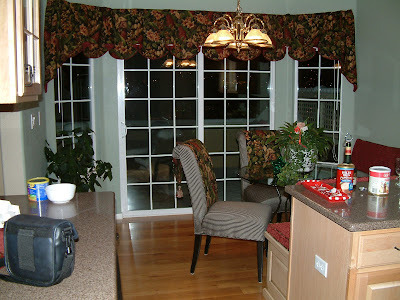 I really love the detail on the tomato valance in your kitchen. And one of my favs is the first one you posted, the richness of the pattern really caught my breath! It was wonderful hearing from a true blue expert in the field! Thanks so much for sharing your home examples with us for SNS #4! 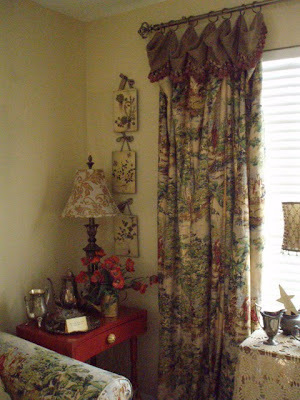 I love all of your window treatments....great fabrics and wonderful designs. Everything is so coordinated....perfect! 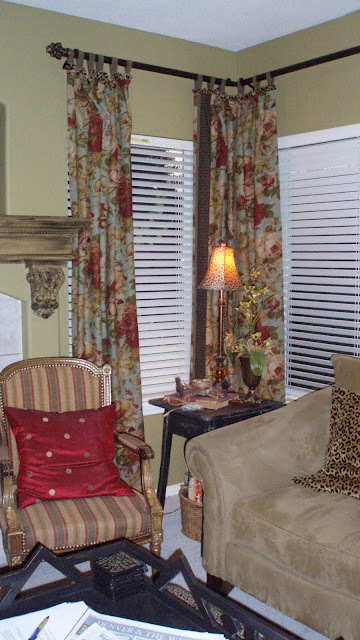 Love your window treatments!! Very professional and look great! I'm very impressed. I can't sew a stitch and have it look right. Woohoo! Thank you Donna. I am looking so forward to it! 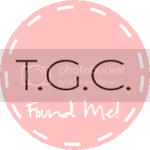 I found your blog through Donna at Funky Junk's window treatment link up, Polly. 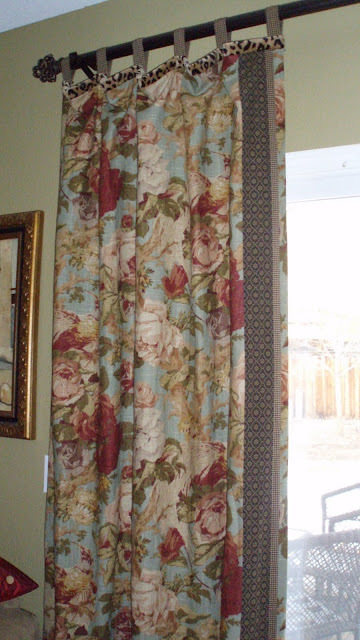 Your window treatments are gorgeous and I love the cuff top in your living room and the tab tops in the family room ~ probably because they are just my style! You're very talented and I'm off to look around the rest of your blog! Thank you everyone. 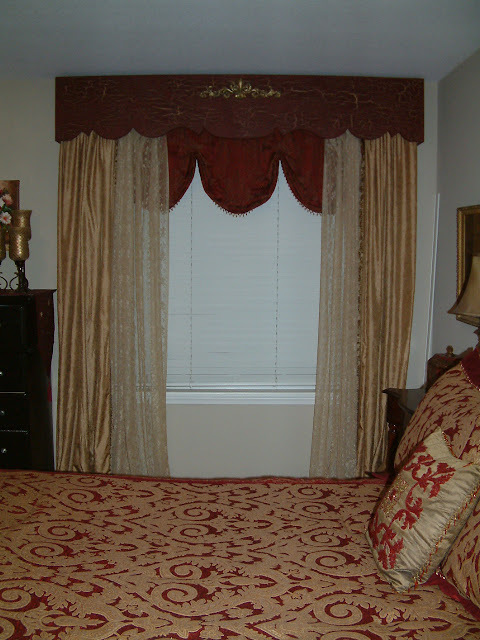 I believe that the right window treatment can truly complete a room properly. There ae so many good ideas in the links at Donna's also. I love the little curtains that have a double row of flour sacks on the bottom. I'm storing that idea for later use.